Vegas Downtown is quite an entertaining game of 21 that is dedicated to the fans of Blackjack. 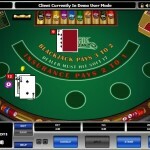 Blackjack is one of the most popular card games in the world and it can be found at almost every land based and online casino. When it comes to online casinos, there are different versions of the game that come with different features and varying rules. Despite that, they all have the same purpose, which is getting a hand total that is equal or close to 21 without busting and going over that number. This is one of these versions; it follows the Vegas Downtown rules of Blackjack. Vegas Downtown by Microgaming is considered to be a blackjack game that is dedicated to the low rollers who are looking forward to enjoy a great number of blackjack hands while having a small gambling budget. 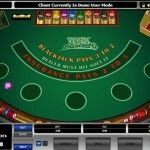 It is one of the few blackjack games online that allow for $1 and $2 dollar bets. – The dealer will have to hit when he gets soft seventeen. – The dealer will peak on ten value cards as well as aces. – The game is played with 2 decks of cards. 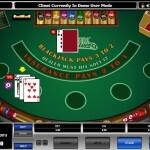 – Players can double down after they split a hand. – The players can split unlike 10 value cards such as a Jack and a 10. – Players will only get one more card after they split aces. – The ability to split three times in order to form 4 hands. As for the gaming procedure of the game, players will start by placing bets, they can do that by choosing a coin size then placing it and click on Deal. They will then be promoted with the different options such as splitting, doubling down, standing, hitting or placing insurance among other options. The game does not offer players the most exquisite and fabulous visuals as there are other games by Microgaming that offer players a far more visually entertaining experience. On the other hand, this makes the game much easier to play and simpler for players, especially novice ones. The game is pretty straightforward with no complicated options or features. Players will place their stakes by simply toggling between the two options that determine the chip size. Players will see a + sign and a – sign at the bottom control panel of the game. The two available chip sizes are only 1 and 2. After players determine the chip size, they will proceed by clicking on the Blue Deal button, which is found on the right side of the control Panel. 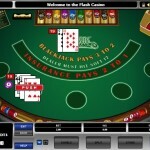 The gaming procedure is quite simple and it resembles other blackjack games. Players who click on Deal will receive two cards facing up while the dealer will receive his two cards, one of them will be revealed and the hole card will be facing down. Players will then be faced with two basic options. The first one is to Hit, which means that they want to get dealt one more card in order to get a hand total that is closer to 21 so they can beat the hand of the dealer. The second option is that they stand, which means that they are satisfied with the hand total they have and that they are ready for the showdown. There are other options that players can come across when they get certain hands. For example, players can split their hand if they get a pair. They will split the 2 cards and create two hands, they will then get 1 card on each hand and they will play each hand separately. They will also place the same bet that they placed on the first hand. Players can also double down when they get certain hand total but they will only get 1 card when they double down.